Rumi speaks a sacred language that we understand with our hearts rather than our minds. He knows the heart is the gateway to divine union and he doesn't want you to play small this lifetime. He encourages humanity to live and love with absolute surrender, abandon and willingness to accept the mysteries of life. Alana Fairchild is a world-renowned spiritual teacher and bestselling author, inspiring a devoted following of fans. Alana's highly original body of work includes oracle decks and books as well as DVDs and albums of guided meditations and sacred music. Alana has also created a unique and powerful online healer training program—Soul Guidance and Sacred Mentoring™—and an in-person initiation program into channelling the divine feminine called The Kuan Yin Transmission™. Blue Angel is a boutique independent publishing house with a strong following of fans around the globe. 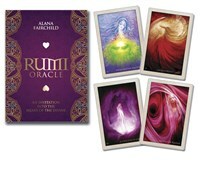 Founded as a specialist bookstore and art gallery in 1997, in 2001 Blue Angel evolved into a publishing company with its first oracle decks, books, and CDs.